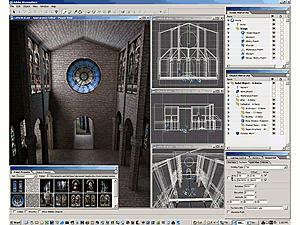 Adobe Atmosphere (informally abbreviated Atmo) was a software platform for interacting with 3D computer graphics. 3D models created with the commercial program could be explored socially using a browser plugin available free of charge. Atmosphere was originally developed by Attitude Software as 3D Anarchy and was later bought by Adobe Systems. The product spent the majority of its lifetime in beta testing. Adobe released the last version of Atmosphere, version 1.0 build 216, in February 2004, then discontinued the software in December that year.